We have found that our son’s elementary school contains an embarrassment of riches (for the record, this is an under-enrolled Title I public school in San Francisco, not the usual candidate for perceived awesomeness, a complete sleeper of a school). These riches extended, we learned this year, to a range of bicycle commute strategies with kids. Bicycle commuting to school in San Francisco is not like it is in other locales. Kids enrolled in lower grades can’t usually ride on their own, due to traffic and hills and distance; this is a citywide school, and some families are coming from quite far away. Moreover, the after-school programs at our school are mostly off-site, and students take the bus from the school, meaning that there’s no way to take a kid’s bike along after school lets out. Finally, we haven’t yet had bike racks installed at the school (we’re on the list) so there’s no place to leave a bike even if kids could ride. The teachers who ride bring their bikes into the school building, but this isn’t something that would work for a bunch of kids. So typically we all have to ride with the kids with us somehow, and as I’ve mentioned before, city people rarely use trailers (they ride below the sight line of cars, tip on uneven pavement, don’t fit in the bike lane, etc. etc.) That means kids on our bikes. It is more challenging than the run-of-the-mill bicycle commute to school, but it’s worth it. We are often ad hoc, but we are ready to roll. 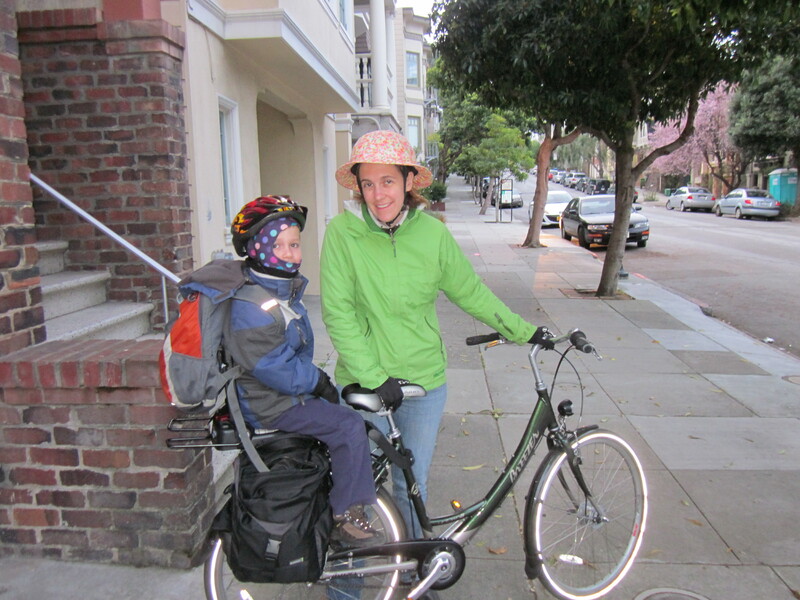 Herewith, a morning’s worth of photos; an incomplete list of the ways we ride to school. #1 (and by far the coolest): Bike Friday triple tandem. Our PTA treasurer and his partner ride this bike with their daughters, who are in kindergarten and 2nd grade. They say it is the best way to commute with two kids to school in the city, and I believe them. It is easier for their dad, who is about 6’ tall, to captain, than it is for their mom, who is more like 5’4”. She reports that she needs help on the hills from the girls and she needs to concentrate while riding. The girls have to synchronize their pedaling with the parent who’s captaining; this is, I am told, not necessary on all tandems, but it is necessary on the Bike Friday [update: not exactly true; my brother-in-law wrote to tell me that any tandem could be retrofitted to have freewheel cranks that let one rider stop pedaling]. 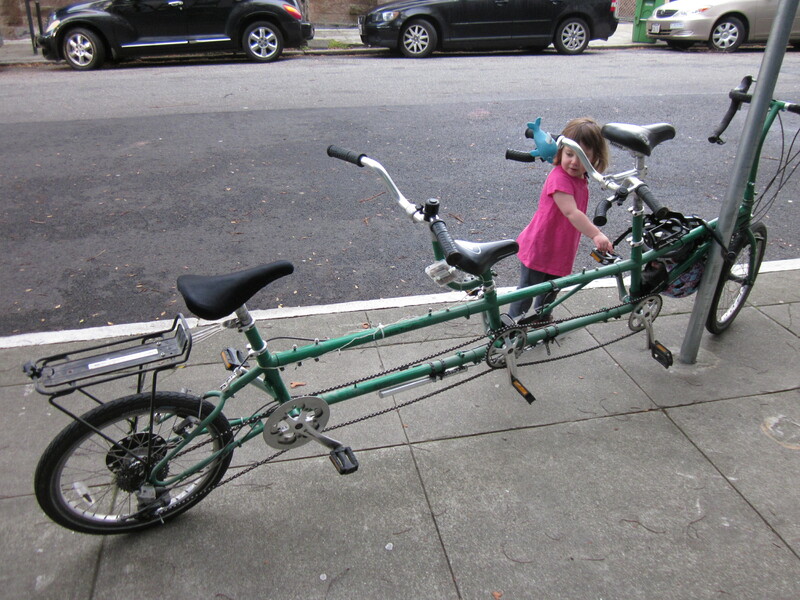 Our kids desperately want a triple tandem. How they afforded it: They used to ride the girls to school on a tricked-out Kona Ute, which they bought and modified by hand while their youngest was still in preschool. They sold the Ute to finance the tandem, which they got for about 1/3 the list price by buying it used on eBay after searching for a used triple tandem for some time. The seller, based in LA, was unwilling to ship it, but they had a cousin in LA they visit regularly. He picked it up, and on their next visit, they took it home with them. The Bike Friday packs up in a suitcase! How they store it: Bike storage is no joke in San Francisco. The girls’ aunt lives on the same block they do and has extra storage space, so they keep the big bikes at her place (they also have an adult tandem that they found used for free and had their bike shop fix up). #2: Surly Big Dummy. Our friend Shirley takes her girls (1st grade and 2nd grade) to school on the deck of her Big Dummy. While they’re in school, she takes the Dummy out to do errands. I have talked about the Dummy before. It is a fun bike. How they afforded it: They have a car that was in a horrible accident and needs several thousand dollars in repairs. Last year, they decided to skip the repairs and drive it until it failed and buy a Big Dummy (plus another bike to come) with the money they saved. When the car dies, they will be car-free. How they store it: “It’s a problem.” They have a very small garage space with their rental apartment and squeeze the bike alongside (I presume that they don’t care about the finish of the car as it’s effectively totaled). When the car finally dies and is hauled away, however, they’ll have a very generous bike stable. #3: Giant with a spare saddle. One of the kindergarten dads has bolted a spare saddle to the top tube of his bike. He puts his daughter on board and takes her to school that way. When I talked with him about it, he said that although his method was totally inappropriate for long rides, their commute to school is a gradual descent over about 10 blocks and so he just coasts slowly the whole way, then drops her off, pops off the spare saddle and commutes to work. How they afforded it: He had a spare saddle lying around anyway: this modification was free. If you had to buy one, I don’t know, $10-$20? How they store it: No extra storage needs; it’s just a normal bike with a saddle on the top tube! #4: Kona MinUte: I’ve written about our MinUte before. We ride our son to school on the back deck; we added stoker bars and some foot-pegs. This is a great bike and a flexible set-up. 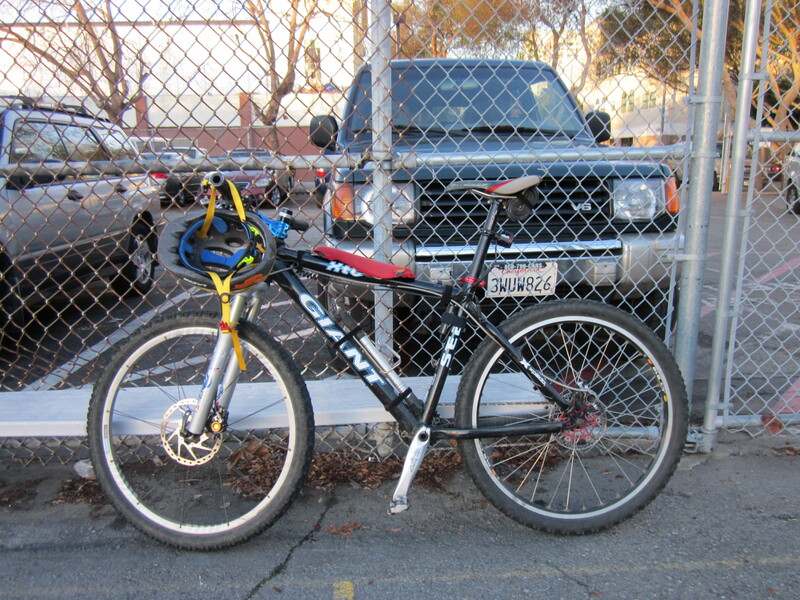 How we afforded it: We bought bikes in lieu of a second car we’d been saving to buy (thank goodness). How we store it: The MinUte isn’t much longer than a normal bike and thus has no real storage issues; Matt keeps it in a shared cubicle at his office, for example. But at home we are rich in space suitable only for bicycle storage thanks to a vituperative 50-year grudge match between the university (we live in university housing) and the local neighborhood association that prevents the partially-conditioned basement under our building, which the university was legally obligated to make ADA-accessible, from being used for a more practical purpose such as housing, or, for that matter, parking more cars. #5: Breezer Uptown 8 with Bobike Junior. I haven’t written much about riding with the Bobike Junior before, as it usually makes more sense for Matt to ride our son to school on the MinUte. But with his recent injury, I’ve been handling the daily trip to school, while Matt walks our daughter to preschool then takes the N-Judah to work. The Bobike Junior takes some getting used to, as the seat rides high, which makes the bike more tippy. It felt unstable at first. But as I’ve gotten used to it, I’ve come to love this seat. 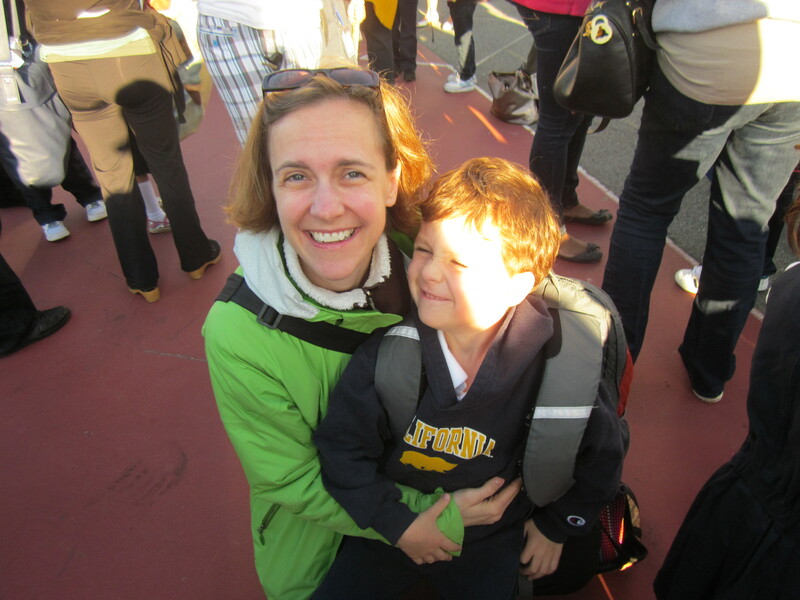 My son rides very close to me, almost as close as a backpack, and I like that when we start the ride, he hugs me from behind. It is easy to have a conversation with him because he is so close. I can turn to talk with him at stoplights and he comments on the ride, encouraging me to go faster downhill (I’m cautious; I don’t have disc brakes). It is a bit of a hassle to fit a pannier underneath this seat, and once it’s on, it encroaches a little on his foot pegs. Nonetheless, I will happily ride with my son on the Junior until he won’t tolerate it anymore. That said, I have a suspicion that this seat might be less appealing to a shorter rider. I am 5’7.5” (to be painfully precise) and that is apparently tall enough that I can handle loads put higher on the bike without much trouble. When our friends with the triple tandem had their Kona Ute, they report that the mom had trouble handling the bike with the girls up so high on the back; she is ~3-4 inches shorter than I am. I’ve noticed that shorter people often mention they prefer to keep the load down lower, but on the other hand, there is a metronome effect. The lower loads are more stable, but if you lose control, it is a nightmare righting the bike again. The higher loads are less stable, but if you lose control, it is much less trouble righting the bike again (assuming you are tall enough). I find that I like the ease of righting the bike given that my kids bounce around a little, but some people prefer just the opposite. 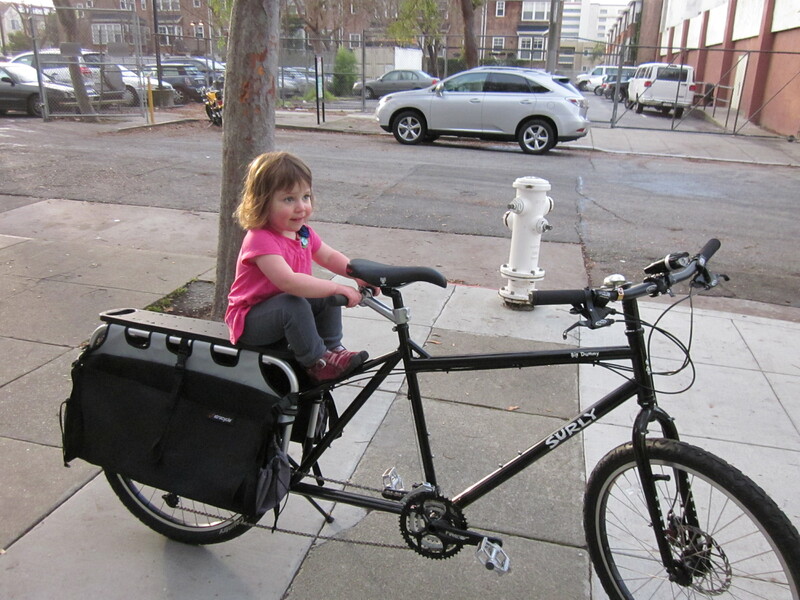 This is not something I’ve seen discussed much but I suspect it may be part of the reason people have strong opinions about the Xtracycle/Yuba lines (lower loads) versus the Ute and regular bikes with child seats (higher loads). How we afforded it, how we store it: See above, blah blah, didn’t get a planned second car, it’s a normal-length bike so no atypical storage concerns, but we have tons of bicycle storage space as a side effect of a long-running town-gown battle. These are some of the ways we ride to school. And this explains, I imagine, why our kids are begging to get a bike as obscure as a triple tandem. Great post, Dorie! A great school and cool ways to ride there. Thanks, Ted! You guys are our heroes. Inspiring piece! Thanks so much for taking the time to write this up. Thanks for the round up! We are on a long bakfeit now, with our almost 3 year old. We’ve had it since she was 1.5. Both my husband (6-1) and i (5-6) can ride it easily. We can do all our shopping/hauling with it. We absolutely love it, but we’ll get to a point where she, and it, are just too heavy. It’s nice to see how other people are handling it. Ps. We afforded it by selling the second car. That’s great! We love the bakfiets and wanted to rent one in Copenhagen, but they’re not really appropriate for the kind of hills we travel (and live on) in San Francisco. I’m glad it was helpful. We’re in the flats of the Mission, so it’s easier for us. I imagine the box bikes are great for talking to your kids while riding. 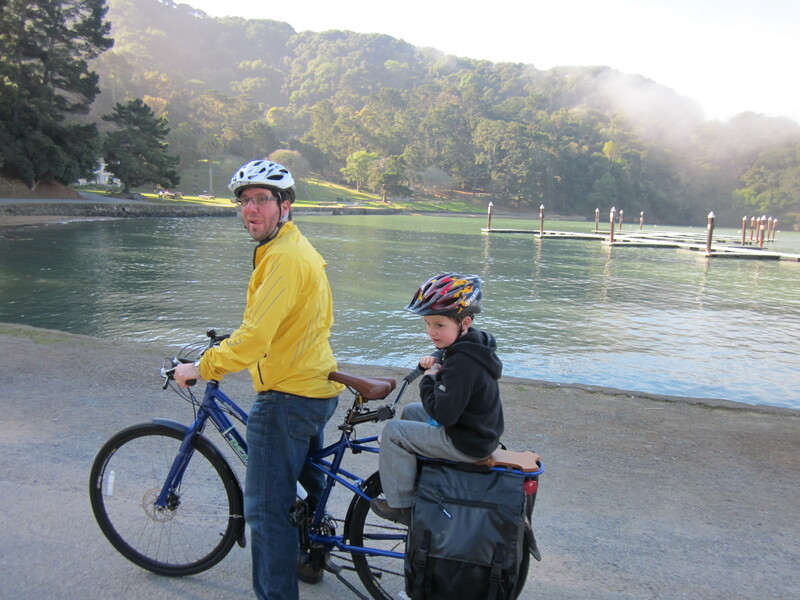 My son’s comments from the back of my cargo big dummy bike are mostly lost. But one critical advantage to having a long tail in SF that I didn’t at first realize- you can take them on BART, the ferries, and (though I haven’t yet done it) caltrain. I don’t know if cargo bikes are aloud if you asked per se, but I’ve had no hassle. No one raised an eyebrow when we took the MinUte on the ferry over winter break; I never even thought to ask whether it was allowed. But although I hadn’t considered it, now that you mention it I imagine that a box bike would not be allowed. They ran out of space for bikes on our ride back and we had to put ours on the back deck, but there would have been no way to get a wide bike through the narrow doorway. I am looking for a way to transport my 5 year old on my Mundo Yuba. I see some options out there, but am looking for real world experience in a seat that allows my child to fall asleep, not just ride along. Excellent information, glad I found this! Have you checked out the blogs of A Simple Six and Tiny Helmets Big Bikes? They’re both riding Mundos with kids of various ages; looking at their setups might be helpful? I am thinking I will get a bobike junior for my big toddler soon. Looks great! I am a little concerned that my back rack might be in the way but maybe I will just get rid of that rack… currently we use a burley honeybee but a non-trailer option would be amazing! Also dreaming of a big dummy one day too! please write a post if Shrek2 is ever looking for a new home. I’m hoping to find a used BF triple tandem before my 2,4,6 year olds get too old. Sorry to tell you that I recently heard Shrek 2 has found a new home–it was swapped with a family friend for an Xtracycled tandem. I will definitely be taking pictures of that bike when I see it! I remember those days when I was the ride in my school field. Thanks.